Crete is the largest of the Greek Islands and the most southern. It is a great place for the adventurous, and for people who would love to spend days at the beach; it has great weather all year round! Troughout your internship Crete, here is always something new to do in your spare time. Location: Crete is one of the most southern of the Greek Islands. It is surrounded by the Sea of Crete and the Mediterranean Sea. Here are several museums situated all across the island, many of them showcase the remains of ruins from ancient buildings that used to be on Crete, telling of its history. You could visit some of them during your hotel internship Crete, although make sure to look on their websites for opening times and entrance fees. From the harbor are spectacular views and the surrounding sites are intricately built with facades carved into the walls. Here, there is also a lighthouse, and from here as well there are wonderful views. The streets are all cobbled, adding to the age of the place, but the shops and cafés are relatively modern, with many shops selling souvenirs and bars open late. 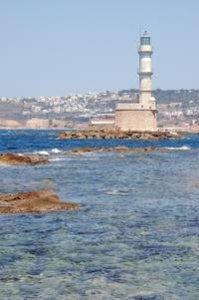 A great place to take in the history of Rethymnon. The place is filled with Venetian and Turkish architecture. There is a Venetian Harbour which is always bustling with locals and tourists. If you are more of an adventurous type then this day outing is right up your street. Taking a walk around this Gorge is highly recommended. There are beautiful, unique views all the way along the walk. There is a bus that can take you from Chania and other towns, these are normally quite early, and this is something to be planned. Walking boots are essential, and it is best to take a packed lunch. All of it is worth it for the views at the end, of the sea and the beaches. This Lake is surrounded by cliffs, hotels and restaurants. 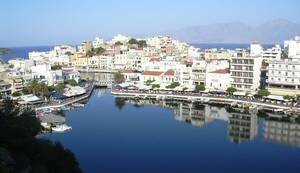 It is a natural lake situated in the centre of Agios Nikolaos. The lake used to be a Sweetwater lake, and has now been connected to the sea. It is a wonderful place to visit, even if you don´t make the trip to the top of one of the cliffs to see a bird’s eye view of it. From the cliff you see the lake with the sea in the background, spectacular! 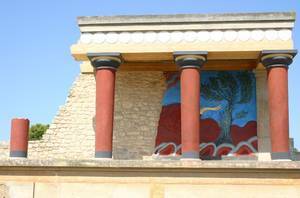 The Palace of Knossos is the most important monument in Crete. The archaeological site, in the valley of the river Kairatos, is just south of Heraklion. It is said to be connected with several Greek legends such as the Labyrinth, the Minotaur and that of Daidalos and Ikaros. This cathedral is situated in Heraklion, away from the hustle and bustle of the centre, with a handful of taverns to sit and enjoy its majestic grandeur from the outside. The cathedral is by a square that is also home to 2 other smaller churches, which are much older and also hold character of their own. It´s said to be a place where you can sit in the shade and relax. This place is full of peace and history; it is a great excuse to leave the beaches and tourists for an hour or so and to see a more hidden side of Crete´s history. Spinalonga is a small island off of Crete near Elounda. It used to be part of the island of Crete, however during the Venetian period, it was carved out, and a fort was built there, as a protection/defense barrier for Crete. Nowadays the island is no longer in use for defense purposes, and there are many tour boats that take tourists out to the island. You can walk up to the top of the Fort, and see an amazing 360° view. The boats leave from various destinations and vary in price. The town of Matala is pleasurable, the caves to the left of the bay are definitely worth a visit, and cost about €3 to enter. The surrounding area is beautiful, with the coast, the cliffs and the caves, with many cafés and restaurants along the promenade. It is said that this beach gets very busy during the peak summer season. On Crete are many places where you can hire bikes from, and take a tour of the area you are in. Some companies also offer guided tours by bike of a city, or certain area – particularly in Heraklion, these can either be full or half days, and they cover a wide variety of terrains, so for the avid “biker” there are plenty of options available. Many places will let you rent the bike for 1 or 3 days, just ask at the desk, or check online as prices and times may vary slightly. Horseback riding is quite popular in Crete, there are several equine centres over the Island and they cater for all ages and abilities. So if you´ve never been horse riding before, give it a try. If you´re a pro at horse riding; go along and keep your skills and ability up. Check online for the nearest centre to you. Some of the centres take you horse riding on different terrains, and the journey can last up to 2 hours long, travelling on beaches, hills and roads. Here are many places that you can go quad biking over the Island, most of them are in land, away from the beach. Check out websites for prices and locations. Many dives schools are situated on the Island, most of them offer PADI diving courses, and introduction sessions. All the equipment and gear is provided for you. Some dive centres will take you out on a boat and start the dive from the boat, but the novices of you, might just start in the shallower water, and go down to a maximum depth of 10 metres. Due to Crete´s warm water temperatures during the summer season you can find various different types of sea life when snorkeling which you can perfectly do during your hotel internship Crete. The best places to snorkel are the rockier beaches and bays, as this provides a more sheltered home for many more species. You should take your own equipment with you to the beaches on Crete as the beach huts do not offer equipment for rent. This being said, some of the diving and snorkeling schools do take people out to nearby islands where there is more chance of seeing larger and a wider variety of sea life, these companies will offer equipment for you to hire for the trip, and sometimes include it in the price of the trip. Make sure you check online and enquire so that you know beforehand. Many car hiring companies are available on the island. Many of them are situated at the airport, while others can be found in the larger towns on the island. Make sure that you check the requirements in terms of age, insurance and license. Here are many ferry companies which offer services to a lot of the smaller fishing villages. These can be great day trips and not that costly. There are also options to travel between the islands of Greece too. On Crete are many great places where you can hire bikes from, some places offer the option for ½ day hire, 1 day hire or 3 day hire. To find more information, search online the store closest to you. On Crete are several bars (tavernas) situated in all cities and especially in the well known tourist areas too, by the beach mainly or with a nice sea view. Crete is not the place you are looking for?